It’s no wonder so many of our participating garages are starting to offer the Specialist “Carbon Cleaning” service as an additional offering. Over the last 20 years, engines have become more complex and the tolerances within the engine have become finer. As a result, it takes just a small amount of contamination to adversely affect engine performance. The most common cause of reduced fuel economy is poor combustion. WHY SHOULD CONTAMINATION BE REMOVED? When a car is new there is no contamination present in the engine, as a consequence fuel economy is at its optimum level. As mileage increases, contamination builds up on different components, resulting in a drop in engine efficiency. Performance and smoothness is compromised. If the contamination is removed using Tec4 engine treatments, performance is restored, emissions are reduced and fuel economy is improved. HOW DO Tec4 TREATMENTS REMOVE CONTAMINATION? Tec4 Oil System Cleaner is a highly concentrated technically advanced formulation designed to clean contaminants from the oil system safely and effectively. 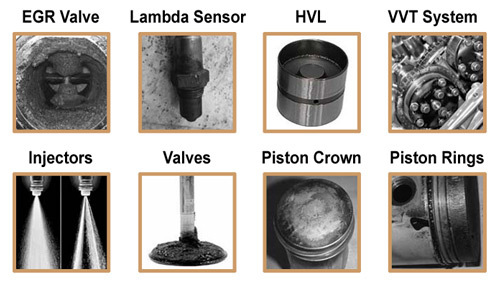 These harmful contaminants are held in suspension and safely removed with the old oil. On completion of the cleaning process the reduced amount of depleted oil left in the engine is acid neutral ensuring the new oil stays cleaner for longer. Tec4 Petrol System Cleaner and Tec4 Diesel System Cleaner are a highly concentrated blend of non combustible detergents, lubricants and acid neutralisers which work in both their liquid and gas state. The contamination is then held in suspension and removed safely through the exhaust.